U.S. stocks fell sharply Friday, with the Dow Jones Industrial Average dropping by more than 650 points. The decline sent the Dow below the psychologically important level of 26,000, which it had just broken through for the first time two-and-a-half weeks ago. The Dow's decline of 2.5 percent was mirrored in other major indices. The S&P 500 fell 2.2 percent, and the Nasdaq Composite declined 2 percent. Friday capped an already tough stretch for the markets, with the Dow logging its worst week in two years. The market has surged in the "Trump rally" as analysts priced in projected higher earnings from the prospect of corporation-friendly tax cuts, regulatory rollbacks and infrastructure investment under the new administration. 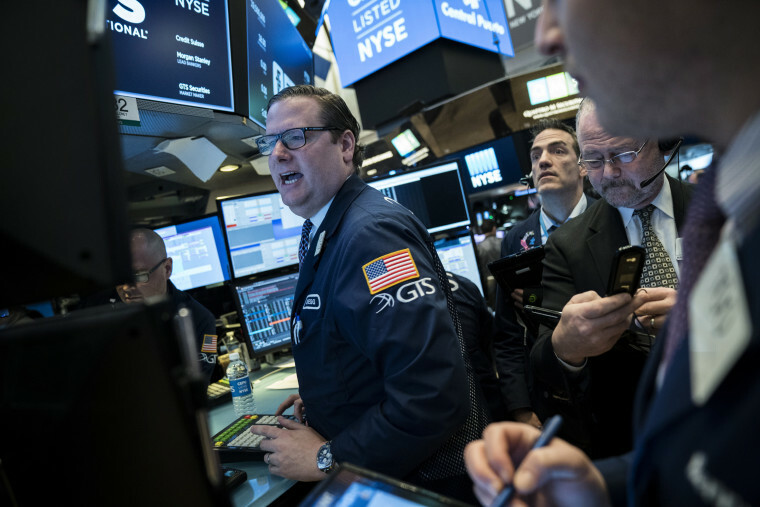 But investors sold off Friday on fears that a stronger-than-expected jobs report would spur the Federal Reserve to raise interest rates more than expected. Higher interest rates for debt can spur investors to pull money out of the stock market to put into bonds. "For months I've been saying the market is underestimating what the Fed will do in raising interest rates," Jurrien Timmer, director of global macroeconomics for Fidelity Investments, told NBC News. "In December, traders thought there would be two to three more hikes. Now it looks like three to four more hikes." And nothing kills a bull market like rising rates. The "good news, bad news" can feel like a whipsaw for investors and shows the delicate balance of keeping the economy's fire humming — one that analysts say Trump is dumping gasoline on by adding tax cuts to an economy already on the upswing. But, said Timmer, it was overall healthier for the market to take notice of interest rates now rather than ignore them and have a big crash. Sort of like "eating your vegetables," he said. The stock market decline might not do much to bolster optimism, but economic data continues to bolster the case that the U.S. is doing just fine. The U.S. added 200,000 jobs during January versus the 190,000 expected, the U.S. Labor Department reported Friday. The fastest accelerating wage growth of the recovery, 2.9 percent, heightened the prospect of tighter monetary policy and a higher interest rate increase, analysts said. President Donald Trump has repeatedly taken to Twitter to tout the stock market gains as a sign of his administration's success, and cited the Dow's gains in speeches and appearances. On Jan. 14, he quoted in two tweets a Fox Business Network contributor who said the "most explosive Stock Market rally that we’ve seen in modern times. 18,000 to 26,000 from Election" had "reversed our economic decline" and was "all Trump." Trump's Twitter feed was silent Friday on the market downturn. The tweets instead highlighted the positive jobs report numbers, took jabs at the FBI and Democrats as the White House approved the release of a controversial House GOP memo alleging an FBI cover-up, and retweeted a positive story about his State of the Union address performance this week. While some pundits questioned whether the incendiary memo was dousing the stock market blaze, experts said the market downswing was all about the numbers. "Sometimes we get something from out of the blue from other areas, but it really comes back to basic fundamentals of economics," Timmer said. "It comes down to the nuts and bolts of earnings, interest rates, liquidity and value."